I hail from Leicester in the East Midlands, and lived there until I was 18 and left with high hopes for college. For a few years, from the age of around 11, I fancied being a DJ. I hosting a pretend radio show regularly with my friend from across the street from our respective bedrooms! We made up our own top 20 charts, including a “B” side chart – we thought some of these were too good to overlook – and broadcasted religiously twice a week for a couple of years. Cate Blanchette, she is a real chameleon, and so believable in each role. To be able to read minds, and really get a sense of what others are thinking and feeling (but unlike Mel Gibson in the film What Women Want, be able to switch it on and off whenever I want). Although I briefly entertained thoughts of being a journalist when I was at school, I quickly rejected this career route when my Careers Officer posed the terrifying question: “would you have the confidence to work amongst the cut and thrust of the red-tops on Fleet Street?” As a shy teenager, I instantly felt my heart sink, and replied with a resounding “no”. With that, we moved seamlessly on to other less scary sounding career suggestions such as the Civil Service. It was only when I took early retirement aged 52 that I really began exploring writing and creativity in more depth. I experimented with journaling, and attended courses on writing poetry to help with grief and loss and workshops on self-publishing. I also posted poems regularly in the online group Damsels in Success, a networking group for women of which I was a member, which led to nominations for a Women Inspiring Women award for my writing in both 2012 and 2013. When not writing, I enjoy regular visits to the theatre, trips to the coast and the lakes, going networking, attending workshops and meeting friends. I enjoy developing my intuition and regularly use oracle cards. This also led me to create my own deck of inspirational Believe oracle cards and an app which, to my delight, won a Janey Lee Grace Gold award. Where did the inspiration for your ‘Believe’ non-fiction books come from? I was encouraged to write the Morning Pages by a coach I worked with soon after I took early retirement. This technique involves free-writing 3 full sides of A4 when you first awake, as espoused by Julia Cameron in her inspirational book on creativity: The Artists Way. After using the technique for about two weeks, I found to my great surprise and delight that my writing began automatically to rhyme. The coach who had encouraged me to write the Morning Pages decided to hold an event: Believe in Your Dreams, Your Legacy, Your Power. Inspired by this theme, I wrote a poem, Believe! I offered to collaborate with my coach by collating a book of inspirational stories by the proposed speakers for her event. Although this book did not happen for various reasons, I rediscovered my Believe poem a few months later. Shaken by reading my own words, I was hit by a sudden realisation – I was meant to go ahead with collating true stories by different women on the topic of self-belief so as to inspire others suffering from low self-belief. I set a goal to self-publish this book, and the result was my first anthology: Believe You Can Succeed published in 2013. I was also spurred on to complete the book when I entered a kindle book challenge run by the I Am Woman business network and by the support and encouragement I received after reading Believe! aloud on stage in front of an audience of 200 women in 2012. 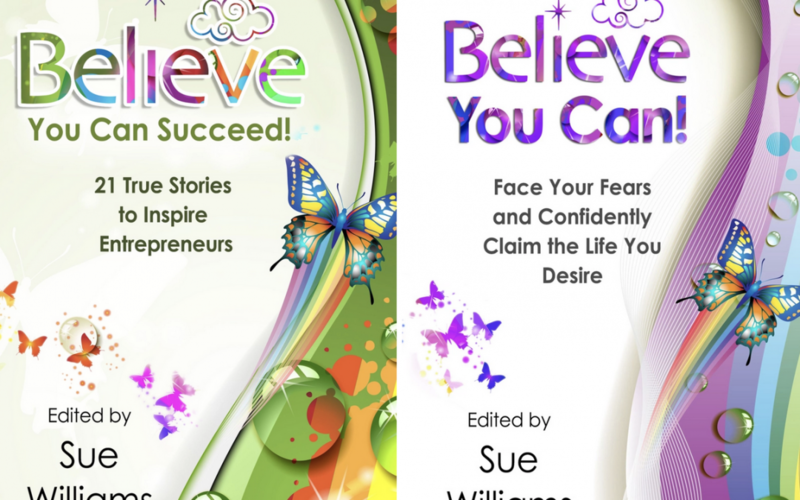 How did you go about collecting the true stories for Believe You Can Succeed? Can you give us a brief excerpt from one of your books? The following excerpt is taken from my story, Creativity and Connection, published in Believe You Can Succeed. I wrote these words early one morning in March 2012. Words flowed easily and effortlessly as I typed into my computer, and within ten to fifteen minutes I had completed my poem: Believe! I stared at the words on the screen before me with amazement. I had no idea why my writing was flowing so easily, and felt slightly puzzled, yet elated, that it was! You blend poetry with real-life stories in Believe You Can! You’ve also written a book of poetry (I Am Unique) that helps inspire self-belief. How important is poetry to you as a personal development writer? Poetry is very important to me as a personal development writer. As mentioned above, it was my poem, Believe! that first inspired me to publish my books. I find poetry is a great way to unleash my creativity and to help express squashed down feelings and emotions. I also think it can bring comfort and inspiration to others. I have been touched to receive feedback as to how my poetry has helped others in times of difficulty. For example, I recently received a thank you message from someone who regularly reads poems from the Believe books when she finds herself feeling down. I am currently updating my first book; Believe You Can Succeed. I will be adding in a small number of new stories and will relaunch it at the end of February 2019. In addition, I am in the process of collating stories from women aged 50 plus for a new anthology of Believe stories to be released in May. Lack of self-belief is something we can all relate to at some time or another, and sharing stories and insight into how others have overcome their fears can be a great inspiration to others when they are at a low point. As for my own writing, I am working on two further self-help books, both aimed at women in their fifties. One of these aims to inspire women to write and publish their own books, the other, The Midlife Detective encourages women to use the tried and tested skills of the detective to solve the mystery of their missing sparkle. Original Article Here (February 2019). Thanks Shelley! Look out for author interviews with those featured in the forthcoming Believe anthology.